Kate Abram has been writing for the National Board for Certification in Occupational Therapy since 2010. Abram holds a Doctor and Master of Arts in occupational therapy from Nova Southeastern University and the University of Southern California, respectively. She also holds Bachelor of Science in molecular, cellular, and developmental biology from the University of California. Participation in any sport should not be limited by gender, as problematic stereotypes can restrict opportunities and may inhibit a girl’s talents and sacrifice her interests. Exposing your daughter to multiple sports is a smart idea because every girl is different and there is not one right sport to learn first. To encourage healthy development, get your daughter involved in sports she shows an interest in and find ways to fuel her motivation. Before giving your daughter options, talk to other parents or teachers in your area to find sports programs with high reputations. Provide your daughter with at least a few sports available to her and let her decide what she wants to try first. Once your daughter is interested in a sport, it is important to keep her motivated to play, because regardless of the sport or sports she chooses, she will reap the benefits of an active lifestyle. Signing your daughter up for a team sport like softball, basketball or soccer will immediately make her part of a team and give her an opportunity to build healthy friendships. Team activities involve competition, and competition encourages a girl to excel. According to a survey by Oppenheimer Funds, girls who play team sports as adolescents are much more likely to be successful later in life. Participation in individual sports like golf, swimming, tennis or running may appeal to your daughter. These sports also can be played on a team. 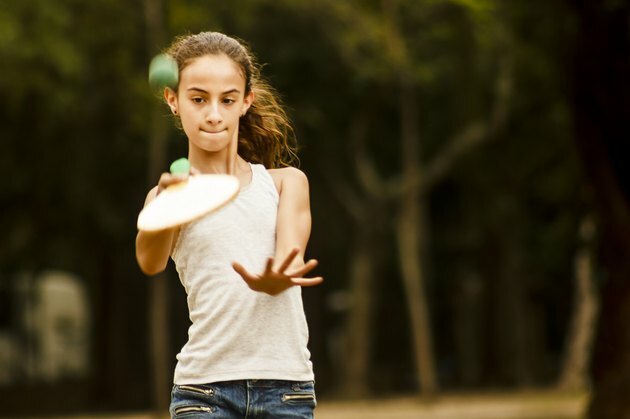 Besides helping your child to maintain her overall health and fitness, regular sports play will improve her coordination, ability to balance, flexibility and strength. Practicing martial arts may be an attractive option for your daughter because size is not an important factor. Participation in martial arts will improve your daughter’s physical and psychological health as well as teach her self-defense, an important skill to develop in life. Commitment to martial arts builds character and is a way to increase your daughter’s confidence. What Are the Benefits of Girls & Boys Playing Sports on the Same Team? How Can a Teenage Girl Lose 40 Lbs. In Six Months? How Does a 12-Year-Old Get Rid of Belly Fat?